This post about frugal dog care tips has been sponsored by the Dog Bark Collar Store but all opinions expressed are my own. When my husband and I were just out of college and struggling to make end’s meat we decided we wanted to get a dog. We decided we wanted to get a BIG dog! Not only did we end up getting a German Shepherd, we got her a friend to play with a year later when we brought home a Dutch Shepherd, too. We quickly had to learn a few frugal dog care tips so we didn’t go broke! We jumped right into dog ownership with both feet and became active in a number of dog sports and obedience competitions. We had to scale back out canine extracurricular activities once we had kids but when we lost our 2 dogs to old age we jumped right in and got another Dutchie. Our current dog’s name is Naughty Teyla and she keeps us on our toes! Throughout our years of dog ownership we have learned a few frugal dog care tips that do not sacrifice quality or compromise the health and happiness of your dog. I thought I would share these frugal dog care tips with my readers in case you are considering adding a dog to your household. 1. Know the dog you are getting: I am not going to debate the purebred vs mutt issue…everyone has their preferences but if you are going with a pure bred dog make sure the breeder knows what they are doing. Both parents should have health screenings appropriate to the breed. Paying more for a well bred dog will save you a ton of money over the life of your pet. Our neighbor bought a poorly bred lab and at age 3 she spent $3000 to have it’s hips replaced. KNOW THE BREED and make sure the breeder knows what they are doing or you could end up spending a fortune on serious health problems. 2. Feed a quality dog food: You may look at the price on a super premium dog food and think it is too expensive but you will feed significantly less food to your dog when it is loaded with nutrients rather than fillers and corn. Not only will you feed less but you will be picking up much less poop which is always a good thing in my mind! 3. Buy Quality Toys: I have a very strong dog with an extremely powerful jaw. She goes through stuffed toys and squeakies like you would not believe. I rarely buy her toys at the pet store because they are very expensive and destroyed easily. Look at some of the online pet stores and find toys specifically designed to last. Of course, if you have a Yorkipoo this might not be a problem but I could go broke replacing the toys my shepherd eats through. 4. Skip the Groomer: It may be easier to drop off Fluffy at the groomer and pick her up a few hours later but you will pay for that convenience. 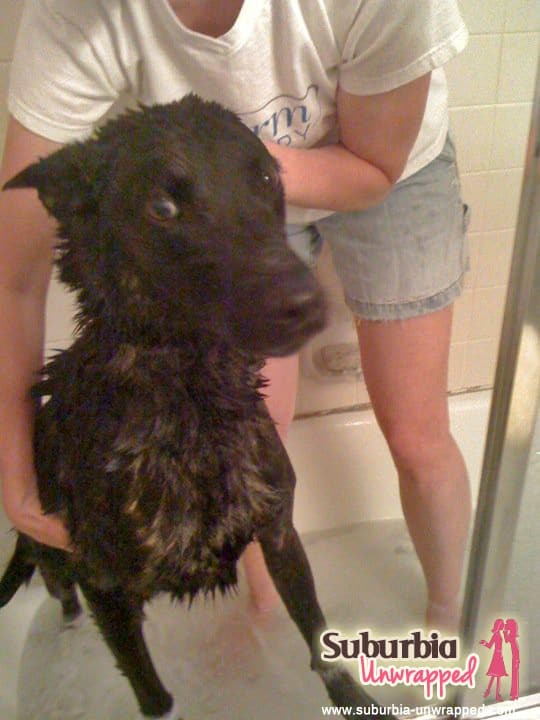 From day one, get your puppy used to baths in the bathtub and having their nails trimmed and coat brushed. If you don’t want the hassle of grooming a dog, go with a low maintenance breed that needs little help looking good. 5. Buy quality but nothing flashy: You really do not need to have a leather leash, bejeweled collar and fancy little outfit. (honestly, my HUGE pet peeve is people who dress up their dogs!). Buy a sturdy nylon leash and collar, ceramic bowls that do nothing fancy but sit on the kitchen floor, and lay down an old comforter in the corner to lie on. Your dog will not miss the fancy fountain that sprays jets of water into the air. Remember, these are animals that are happy drinking out of the toilet. No need for fancy water systems! Remember, owning a dog isn’t cheap but hopefully these frugal dog care tips will help you raise a happy, healthy dog without going broke. Make sure you take your pet to the veterinarian every year and give them whatever vitamins or medicines he or she recommends. It is cheaper to keep your pet healthy than to treat an animal that is sick! 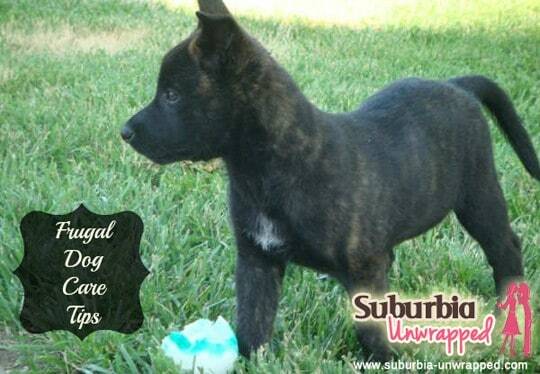 Do you have any frugal dog care tips that you would like to share? Great tips. Planning ahead is always important!